Food stamps don’t pay for diapers. It costs about $18/week to keep a baby/toddler in diapers. What are people supposed to do when they need to make a choice between diapers, food, rent, utilities, etc? Some people clean a diaper out and reuse it. Other parents leave their baby in dirty diapers for an extended time to stretch their diaper budget. This is very unsanitary and can cause diseases. Cloth diapers are not an option because many laundromat facilities do not allow dirty diapers to be washed in their facilities. Another problem with this solution is day care centers require disposable diapers. On an international level, Alpha Kappa Alpha Sorority, Inc. is focused on Family Strengthening as one of their targets. The Pasadena Chapter is impacting this target through outreach programs that benefit the underserved in our community. They recently donated approximately $1000 in diapers to Foothill Unity Center where they will be distributed to those in need throughout the Pasadena/Altadena Community. As food and clothing are given to homeless and low income shelters, diapers are often forgotten. The recent recession has driven more families to need help. The high cost of diapers and the lack of support to purchase them is often overlooked. This creates another burden on an already underserved community. If you would like to join the Pasadena Chapter of AKA in closing this gap in the Pasadena/Altadena community, please contact Foothill Unity Center Pasadena on (626) 584-7420 or drop off some diapers at their facility located at 191 N. Oak Ave, Pasadena, CA. · Cardiovascular diseases are the leading cause of death for African-American women with nearly 50,000 dying annually. · Only 43% of African American women and 44% of Hispanic women know that heart disease is their greatest health risk, compared with 60% of Caucasian women. · Of African-American women ages 20 and older, 48.9% have cardiovascular disease, but only 20% believe they are at risk. · Only 50% of African-American women are aware of the signs and symptoms of a heart attack. In order to bend the curve and put a highlight on this issue that is prevalent in the black community, Alpha Kappa Alpha Sorority, Incorporated (AKA) has developed a national partnership with the American Heart Association to raise awareness of this issue through “Pink Goes Red for a Day.” On February 6, 2015, the Pasadena Chapter of AKA was one of over 980 AKA Chapters around the world to participate in this Community Impact Day. The Pasadena Chapter focused on exercise as a way to reduce the risk for cardiovascular disease. 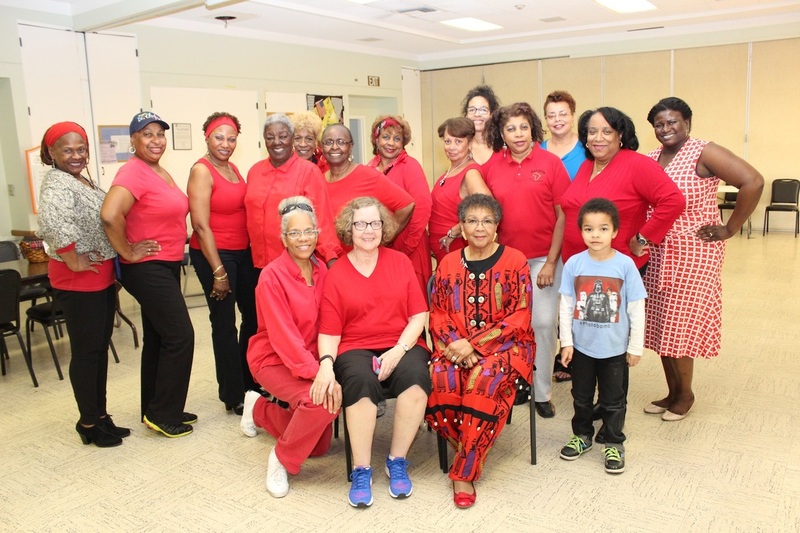 Members wore Red as their outward visibility of heart health and invited the community to attend a weekly Line Dancing Class at the Altadena Senior Center. The class was a fun way to incorporate exercise into their lifestyle without feeling like it was a chore. The Pasadena Chapter of AKA has adopted the practice of promoting healthy living and encouraging health promotion in all aspects of their programming and community service projects throughout the year. · Avoid or quit smoking. · Lose weight and/or maintain a healthy body weight. · Exercise for more than 30 minutes at least three times per week. · Follow a diet that is low in saturated fat; low in trans-fat; and high in fiber, whole grains, legumes (such as beans and peas), fruits, vegetables, and fish. In other words, eat as close to nature as possible and avoid processed foods. 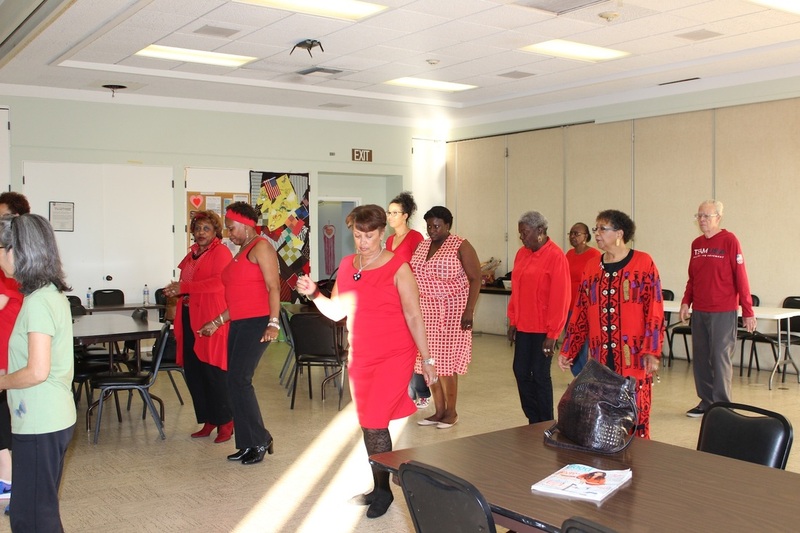 The Pink and Green ladies of the Pasadena Chapter of AKA went Red for a day to bring awareness to the devastating impact of heart disease on women, especially those of color. They are challenging everyone to go Red for a lifetime.